Lam Tsuen Country Park is situated in the Northern New Territories. Designated in 1979, it commands a total area of 1,520 hectares that spans over Tai Po, Fanling and Yuen Long. The park is divided into two parts by Fan Kam Road : Tai To Yan and Kai Kung Leng. It is an attractive country park with grand uplands, sylvan woodlands and gurgling streams. The two summits Tai To Yan and Kai Kung Leng rank 9th and 10th respectively among Hong Kong's peaks. 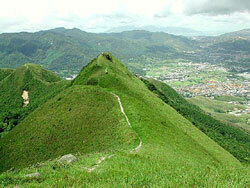 Both rugged volcanic crests, they command a towering presence in the Lam Tsuen lowlands. 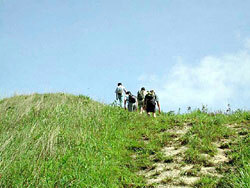 Hill trails in Lam Tsuen Country Park are challenging and strenuous, thus suitable only for the fit and experienced. Atop the ridge, you enjoy broad views of Yuen Long Plain and Lam Tsuen Valley. As its Chinese name implies, Tai To Yan is a treacherous peak with razor sharp ridges and crags. The ascent is narrow and hazardous, with dizzying escarpments on both sides. The only precarious pathway along the ridge is highly exposed and gets quite nerve-wrecking on windy days. Definitely not a route for the faint-hearted. Kwai Kok Shan (585m) of Kai Kung Leng is the highest point of Lam Tsuen Country Park. To the south of the peak lies the Kam Tin Basin. Kam Tin, originally a part of Bao An County, was known as Sam Tin until the reign of Emperor Shenzong in the Ming Dynasty. The Tang lineage of Kam Tin dates back many centuries. Genealogy records of the clan show that the Tangs' forefathers migrated to Sam Tin in the Song Dynasty, and founded the Liying School at the foot of Kwai Kok Shan. Starting off at Fanling or Yuen Long, the hike to Lam Tsuen Country Park is taxing. The gravelly hill path winds up steep rugged slopes, but there are grand shanshui along the way. Up on the ridge, the gaze takes in Yuen Long Plain, Nam Sang Wai, Mai Po and Deep Bay, set against Shenzhen in the far distance. Immediately below the slopes are Fairview Park and Kam Tin. There are information boards in the park. To prevent accidental falls, dangerous sections of the path are fitted with metal chains. Kadoorie Farm nearby and the woodlands behind Pak Ngau Shek Village are extremely rich in flora. In these pastoral plantations, you find Machilus species, Taiwan Acacia (Acacia confusa) and Brisbane Box (Lophostemon confertus). In the forests behind Pak Ngau Shek Village, a 20 m row of Acacias make up a green firebreak that can effectively stop hillfires from spreading. Outcrops and boulders are common in Tai To Yan. The plant growing on the rock surface is Creeping Psychotria (Psychotria serpens), a very slow growing vine with thick water-rich leaves to provide moisture during drought, and small white fruit with a black dot in the middle that resembles the eye of a dragon. This plant has an amazing way of survival. Roots are developed in its stems to get a firm hold on rocks or tree trunks. Once secured, it reaches for the top in an aggressive fashion. 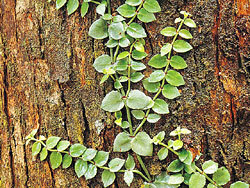 Well adapted to habitats of poor sunlight, it can be found in the understorey of dense forests. The local plantations are home to a host of wild animals, such as Chinese Porcupine (Hystrix brachyura), Chinese Ferret Badger (Melogale moschata), Chinese Pangolin (Manis pentadactyla) and Chinese Leopard Cat (Felis bengalensis). Birds and butterflies occurring here include Chinese Bulbul (Pycnonotus sinensis), Crested Bulbul (Pycnonotus jocosus), White-backed Munia (Lonchura striata) and Common Mormon (Papilio polytes), Eurema, Red Helen (Papilio helenus), Great Orange Tip (Hebomoia glaucippe glaucippe), Rustic (Cupha erymanthis erymanthis), Great Mormon (Papilio memnon), Lemon Emigrant (Catopsilia pomona pomona) and Peacock Pansy (Junonia almana almana). The woodlands also support diverse dragonflies and insects, as well as many trees of elegant forms. 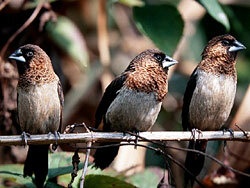 If plants, birds and insects are your favourite subjects, Lam Tsuen Country Park is not to be missed. 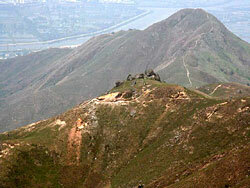 Most hikers visit Lam Tsuen Country Park for the notorious summit of Tai To Yan. The trail begins at a small roadside hill path opposite Kadoorie Farm & Botanic Garden. Only a little distance up the slope, Pat Heung, Shek Kong and Lam Tsuen Valley come into view. The ascent to Tai To Yan is exhilarating. Tracing the windswept ridgeline is like walking on a blade. With gale force wind blowing on most days, maintaining a steady posture is a major challenge. In early spring, wild rhododendrons adorn the nearby slopes. In autumn and winter, the uplands are emblazed by a dash of amber. When summer comes, all is lush and green again. Some sections of the Tai To Yan trail have warning signs that read "Steep cliff ahead". There are also steps and metal railings to prevent accidental falls. The summit of Tai To Yan stands 565 metres above sea level, while the peak of Pak Tai To Yan rears up 479 metres. At these vantage points, you enjoy an extensive view of the bucolic Yuen Long Plain and beyond.